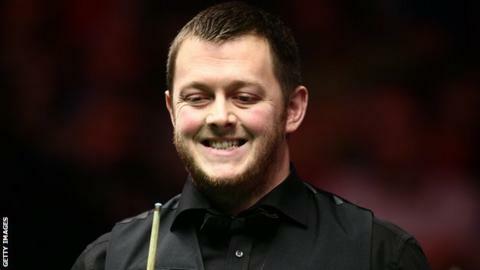 Former world champion Dennis Taylor says Mark Allen has the talent to follow in his footsteps and win the World Championship. World number 12 Allen produced impressive form in beating Ryan Day on Tuesday to secure a second-round meeting with Barry Hawkins on Friday. Taylor, who won the 1985 title, told BBC Sport: "It's time we had another world champion from Northern Ireland. "He has the ability. There is no reason why he cannot win the big one." Allen, who comes from Antrim, won nine consecutive frames to see off Welsh qualifier Day 10-3 in the first-round game. But Taylor, who defeated Steve Davis in a memorable final 30 years ago, warned that his 29-year-old countryman will have to improve against world number five Hawkins. "Mark did very well but Ryan let him off the hook," said 66-year-old Taylor. "I have never seen Ryan miss so many easy shots and Mark took full advantage. Ryan just lost it completely. "Facing Barry will be tough, but Mark has a great chance of getting through to the quarter-finals. "I don't know if Barry will make as many mistakes as Ryan did but you still have to knock them in and Mark did that." Taylor and Alex Higgins are the only Northern Irishmen to the world title but Taylor said Allen has the self-belief needed to become the third. "He is not frightened of anyone and will tell you that himself," added Taylor, who clinched his triumph with a thrilling 18-17 victory over Davis 30 years ago. "He is a very confident person but it so difficult to win here at Sheffield. Seventeen days is a long stint. "He is in with a good chance but he has to play at the top of his game because there are four or five players that are playing exceptionally well." Hawkins, who survived an incredible comeback from Matthew Selt to edge through his opener 10-9, said: "It just gets tougher and tougher from now on. "Mark is so gritty and determined and is a great player. If he gets going he bangs in big breaks all day long and he has a great all-round game. "I like the way Mark plays and I am thoroughly looking forward to it."